A wide ball does not count as one of the bowler's six legitimate balls in one over. 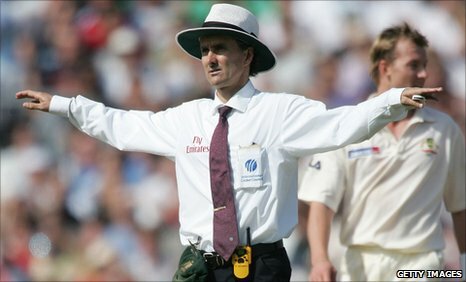 It is the umpire's job to decide when a wide ball has been bowled. A wide ball will be called when the batsman, playing a normal stroke, is unable to reach the ball. This can apply to a bouncer above head height. - It is out of the batsman's reach as a result of him moving away from it. - The batsman can bring the ball within reach by playing a conventional stroke. - The ball touches the batsman's bat or any part of his body. The umpire will signal a wide ball by raising both arms at shoulder height and the bowler must bowl another legitimate delivery. For every wide ball the fielding team is penalised one run. This run, along with any other runs gained as a result of the wide ball, is added to the batting team's tally of extras and does count against the bowler's individual figures. Umpires' interpretation of what constitutes a wide ball is much stricter in limited-overs cricket than in first-class cricket, particularly with deliveries down the leg side. A batsman can be stumped off a wide.